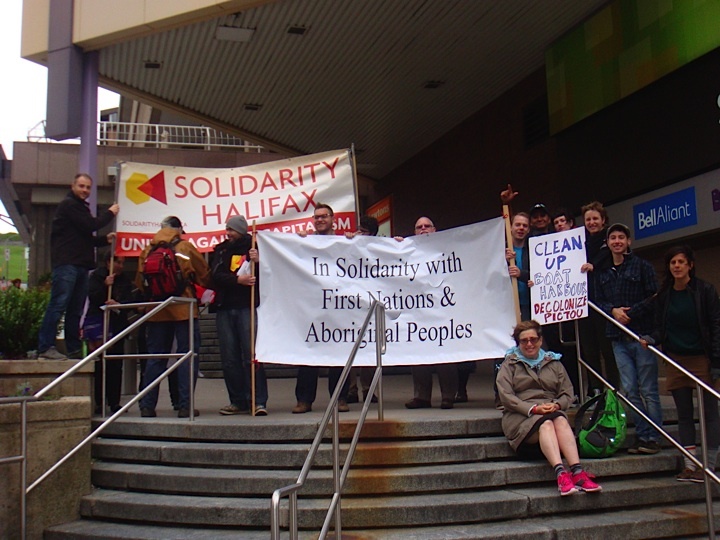 On June 13, 2014, the Nova Scotia Public Interest Research Group (NSPIRG) convened a rally in support of Pictou Landing First Nation and Solidarity Halifax members were present to show our support. The following Monday morning, June 16, Solidarity Halifax and NSPIRG organized an information picket at the corner of Barrington St and Duke St to show our support for Pictou Landing First Nation and raise awareness about what is at stake. The Halifax Media Coop covers the June 13 rally. Place the marker at 1:30 to see a short CTV report of Monday’s info picket in solidarity with Pictou Landing First Nation. Placez le marqueur à 1:14 pour entendre une entrevue avec Sébastien Labelle, membre de Solidarity Halifax, au sujet du blockus érigé à Pictou Landing et des raisons pour lesquelles nous sommes solidaires avec la communauté autochtone. See photos below of both Halifax events in support of Pictou Landing. Photos: Tori Ball, Yolande Grant and Angela MacIvor (CBC).